Select the items to sort by. 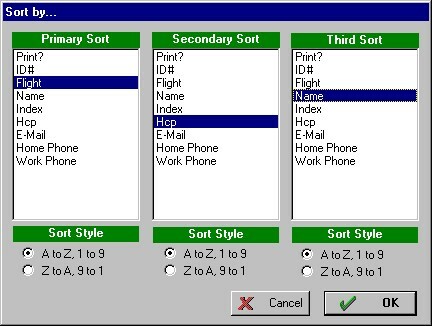 Also select the sort order (A to Z) or (Z to A). Click [OK] to sort the golfers. Note: HS can sort by 1, 2, or 3 items. In the above example, golfers will first be sorted by flight, then by handicap, and if handicaps are equal then they will be sorted by name.